Our first "Silver Long-Service awards" - yes, some of our team have clocked up 200 rehearsals now! Happy Christmas from all of us in hago! Our Christmas message of goodwill to all is accompanied by hago playing John Rutter's Candlelight Carol, here recorded in 2002, but we played it just last week at our annual Carol Evening at local Sheltered Accommodation. December 1st - as promised, we're letting you know the total raised in our recent concert (see November 21st below) - we're delighted to tell you that the Hospice has received over £784. If you came to the event, thank you for helping to make the event so successful! Map from southwick train station to church - happy to help! Southwick doesn't have a train station; does that help? Rule of 18 - er.... "It's the way to get into a pub legally?" Simple harmonicostion guitar strng - Proud to be the site Google recommends for the totally non-existent words "harmonicostion" and "strng"
Smaller than guitar - "Football, Potato, Ball Bearing, Paper Clip, Tea Spoon, Hydrogen Atom, Stag Beetle... no, we give up. Please tell us! ...The combined sound (of the alto prime bass and contra guitars) is almost unique and the audience was surprised at how delicate and yet powerful the music could be, as was the case with "The Devil's Galop" and "La Partida"
What a fantastic audience we had! We'll post the fund-raising total here as soon as we have it. But a real concert is much better. Not only do you find out what goes on between items, but you'll be helping to raise money for charity too! Buses Bedhampton to Hayling Island - if all else fails, ask a guitarist! November 1st - visits to our YouTube channel last month were the highest ever and 24% up on the month before. October 23rd - it was a great thrill and a privilege to be invited back to the Royal Star and Garter home in Richmond to play a morning concert. It was also rather an early start! There are photos at the bottom of our 2010 gallery page. ...it was a wonderful evening and thank you for such an wide range of music and styles and we had so many people that were not from the church. Apart from repaying the loan the whole idea of these concerts is to open the building to the community and that was very much in evidence on Saturday. Farlington Bus Depot - there isn't one! Smaller than a guitar - coffee mug, dearfoam slippers, a stick of rhubarb. Nope - we give up... What's smaller than a guitar? When was the petersfield community centre - well, actually, it still is! September 21st - we're nearly Page 3 stunners. We're featured in the latest issue of BMG (Banjo Mandolin and Guitar), which is the oldest fretted instrument magazine in the world, having first appeared in 1903. The article is based on an interview by Phil Jones, and features brief information about our history, our fund-raising and the instruments that we play. It's hard not to get confused - BMG Magazine is different from the BMG Newsletter, which is the publication on the Banjo Mandolin and Guitar Federation, who also featured us in an article recently. We can't help noticing that guitar seems to be at the end of the list of instruments - that's not where we'd place it! September 7th - we're delighted that our "just for fun" video this summer is now first in the featured videos on the Exbury Gardens website - see this page... Serendipitously, the piece of music accompanying the video below it (Handel's Saraband) is a piece our Musical Director's other ensemble play! September 5th - the summer break draws to a close (ironically just as the weather was showing signs of becoming more settled) and here in hago we're thinking about the forthcoming concert season. We have a couple of prospective concerts in planning too, just as soon as we can get replies from the promoters, so keep checking back. If you've been to more than one hago concert, you'll know that we're constantly making small changes to our programme, and our forthcoming season will be no different, with a new arrangement of a piece we last played many years ago, and a brand new piece that really seems to sit well on guitar. July 1st - Every month in the last 12 months, our YouTube videos have attracted more viewers than the month before, and views are now running at more than three times the number a year ago. June 24th - today, our YouTube channel reported that our videos have now been watched 20,000 times. Paysage Ibérique is the most popular right now. June 18th - what a great audience at last night's concert at Waterlooville Music Festival - it was a pleasure to share a concert with Phil Jones and Douce Ambiance. We've had the following comments! May 28th - It's not the end of the month yet, but already the number of views of our videos on YouTube in May has beaten April's figure, and Eternal Flame has become the hago video that's most popular at the moment - and it does fit guitar really well. May 27th - Our May 22nd concert raised £529 for Friends of Sheet School - a wonderful total - thank you all for coming. It brings our fund-raising total to £49546 - our next concert is on June 17th at Waterlooville Music Festival. May 20th - Our new bass guitar had a mouse in it! What? Yes - check out the photo at the foot of our gallery page. May 16th - We've just purchased a second-hand b-bass guitar to make our orchestration even more "not-mainstream". You can see a photo in our gallery (scroll right down) where it's cuddling up to our MD's alto - there's a link to a page all about the Tornavoz we've just fitted to improve the sound. We're delighted to tell you that we've uploaded another video to YouTube - pictures of the wonderful Exbury Gardens here in Hampshire, taken just yesterday and set to a live recording of hago playing "Song from a Secret Garden"
May 7th - We rehearsed as usual last night in the Small Hall at Lovedean, but the Large Hall was a Polling Station and we had a lot of kids' noses pressed against the window! Who knows - if we inspired them, then in a few years time we might be auditioning them! May 4th - We've just heard that our April 17th concert raised £400 for the Emsworth Baptist Church Building Fund. It brings our fund-raising total to £49,017 - thank you all! May 3rd - Under three weeks now till our next concert, in the fabulous Olivier Theatre at Bedales, near Petersfield. We're adding yet more music to our repertoire, some of which we expect to premier at our biennial concert with Cambridge Guitar Orchestra, a concert which has traditionally seen lots of local guitarists attending - a unique chance to hear a massive range of styles. May 1st - There was a significant rise in the number of views of our Eternal Flame video after our April 17th concert (we'll post the fund-raising total as soon as we have it). At our April concert we changed our orchestration and it's really come alive now - you can hear the new version in our future concerts! April 25th - The Portsmouth Festivities 2010 is now launched, and we're delighted to be part of it again, with our concert featuring Cambridge Guitar Orchestra on Saturday June 26. April 18th - Our concert last night at Emsworth took place on the first really lovely warm evening of the year. There's a photo of our soundcheck in our 2010 gallery. We'll post the fundraising total here as soon as we have it. The organiser writes "Many people have spoken of the very considerable enjoyment that the Concert gave them"
April 16th - Our rehearsal last night was special in so many ways - the new team playing together for the first time and a cracking new piece that we'll be performing later this season, but the icing on the cake (oh yes, we had cakes too - very important to mention that!) was the presentation of our first Silver Long Service Awards. These are presented to those who've attended 200 rehearsals. There's a photo here. April 1st - April Fool's Day has passed without our Musical Director inflicting yet another one on the unsuspecting folk who inhabit the cloistered world of classical guitar. But like Arnie Schwarzenegger or a cold sore, he'll be back when least expected. 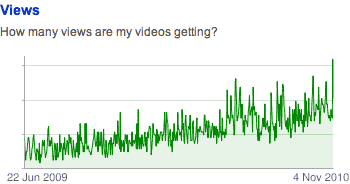 March 28th - The number of views of our videos on YouTube continues to rise for the eleventh month in succession. Today is the first day of British Summer Time, which means that officially the British Summer (such as it is!) is on its way. And that means that we move from the season when Churches are cold to the season when they are rather pleasant to sit in. And our first concert of the summer season is on April 17th in Emsworth. Emsworth is famous for its Solar Boat, which features in our recent video. March 25th - We've placed another new photo at the bottom of our 2010 gallery. March 21st - Last night's concert with Flautissimo was one of the most fun concerts we can remember. With five sizes of flute (piccolo, concert flute, alto, bass and contra), they provided a sweet and powerful sound that was a delightful contrast to our own, plucked sounds. The acoustic at the Turner Sims, Southampton, was nothing less than fantastic. Flautissimo's programme, which included some medieval dances at one end of the stylistic scale, and Holst's The Planets at the other, was a delight. You can read more about Flautissimo at their website. March 19th - We've added more photos to our 2010 gallery. March 13th - many of us in hago thoroughly enjoyed the first episode of the BBC 2 programme "A Band for Britain" (available for 2 more weeks on iPlayer). If you're a classical guitarist and wished that guitarists had same opportunity for exhilarating music, camaraderie and concerts that these brass players are having, well, we've got seats in hago that you might be able to fill. We're moving onwards and upwards again and this is a great time to get on board! Read more about joining hago here and then don't wait a minute longer - get in touch! March 9th - we are terribly disappointed to announce that the promoter has cancelled our concert on March 13th. So sorry if you were planning to attend. March 5th - our rehearsal last night was our largest ever, and was just after our eleventh birthday. Which can mean only one thing. Cake! We've added some photos to our 2010 gallery. Now the fine weather is on its way again, you might like to add a trip to your list of things to do this year - you'll love it! February 28th - some classical guitarists seem incredibly aloof, and yesterday's Guitar Section at Portsmouth Music Festival again threw up a handful of very insular characters. Not so Graham Cleaver & Gilly Slot who beamed smiles and shook hands with the hago players who'd come to support the day. And we're delighted, therefore, that they won the hago cup, for the best ensemble performance - deservedly so! The Adjudicator was Richard Durrant, and he also broke the mould - he was inspirational, and there can't have been a competitor who didn't go away determined to raise their game still higher. A special mention goes to the many kids who produced such confident and musical pieces - tomorrow's guitarists in action! In a triumph of spell-checker technology over poor spelling, we see that someone found our Fields of Gold YouTube video by searching for "Portsmouth Old Pikchers"
February 19th - we were delighted to welcome two more talented guitarists along to last night's rehearsal. We're hoping they'll join us permanently. We certainly had a lot of music and laughter (and food - what is it about playing guitar than means one just HAS to have something to eat in the middle of rehearsal?). It was a perfect occasion to take some snaps and start off 2010's photo album. February 15th - our good friends at Cambridge Guitar Orchestra (we're sharing a concert with them in June) are holding a Guitar Weekend in October, so if you live round those parts or you fancy a weekend away, check out their website. Note that there is little accommodation left - book soon! Closer to home, our Musical Director's informal ensemble, the Guitar Workshop at Farlington had the largest attendance for many years with 32 players and two guitarists coming for a free trial. If you play at novice or intermediate level and want to enjoy a working play-list of 150 ensembles, come along to Derek's Guitar Workshop fortnightly on Thursday evenings. February 8th - If you haven't heard of the Emsworth Solar Boat - a battery-powered catamaran that is recharged by solar panels - then let us take you on a short video tour of Chichester Harbour, accompanied by hago playing the hornpipe from Handel's Water Music. The video is also now listed on our Audio and Video page. February 4th - We've made a couple of changes to our website. One or two links will now take you across to our Musical Director's website where those pages now reside. 24th January - Well, those of you in the UK will know what a white start it was to the New Year, and our first rehearsal became our first that was cancelled due to the weather. But we met last week, and already we have a new arrangement that looks like it's not only going to be rather special, but will be familiar to everyone too! 1st January - In the year just gone, we served over 600,000 pages to visitors like yourselves - welcome to our website! Happy New Year, from all of us in hago - the Hampshire Guitar Orchestra! A year ago we were talking about the world financial crisis, and saying that it didn't seem to be impacting on the amount of money we'd been able to raise for charity. One year on, the UK is still in recession (despite our Prime Minister saying that we were best placed to be first out of the gloom). We certainly win a prize for leaving the recession, but unfortunately it's the booby prize. But... our the amount we raised for charity went up by 25%. Isn't that remarkable? And isn't it wonderful!